Their aim is to get something built on Valencia that physically separates cyclists and drivers on the road to avoid collisions. As it stands, the street has painted bike lanes, but nothing stops drivers from rolling into them to make a “quick” stop — to dash into a restaurant and pick up a takeout order, to pick up a group of drunk ride-hail passengers, or to drop off a friend or delivery. That’s the source of much chagrin among cyclists, and in some cases, leads to collisions. 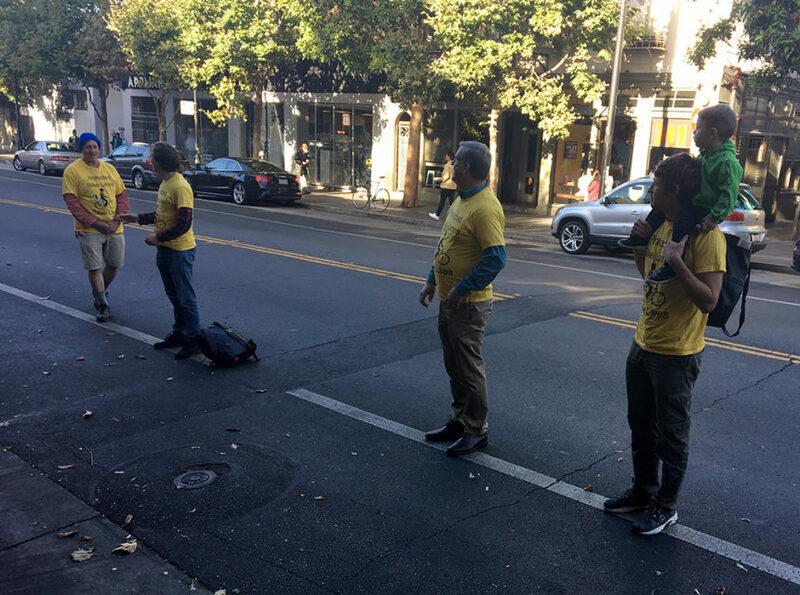 District 8 Supervisor Jeff Sheehy, whose district covers the western side of Valencia Street, showed his support for barriers between bike lanes and drivers by joining the activists standing on the painted lane divider. His first job, he said, was as a bike messenger — a knee injury keeps him off his bike these days, but he understands the safety concern. 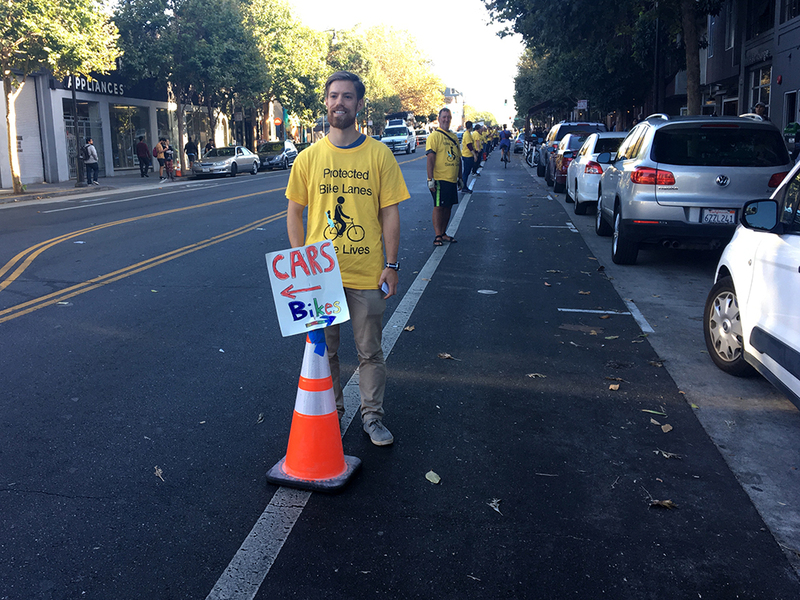 He and District 9 Supervisor Hillary Ronen have both called for protected bike lanes in the past. He’s heard a number of proposals, including bike lanes in the center of the roads, or installing some kind of barrier between the vehicle and bicycle lanes. “It doesn’t matter to me which solution it is, but we do need a solution,” he said. But creating a barrier could get tricky when it comes to public opinion. As Kyle Grochmal, one of the cycling advocates out on the street Thursday, pointed out, a five-foot buffer requirement between parking and bike lanes would mean that a good portion of Valencia would have to have parking only on one side of the street, because the road simply isn’t wide enough to accommodate two parking lanes, two bike lanes and two driver lanes. But Sheehy said once the cycling community comes to a consensus and pushes for what form it really wants, he’d be supportive — even if there is a parking concern. 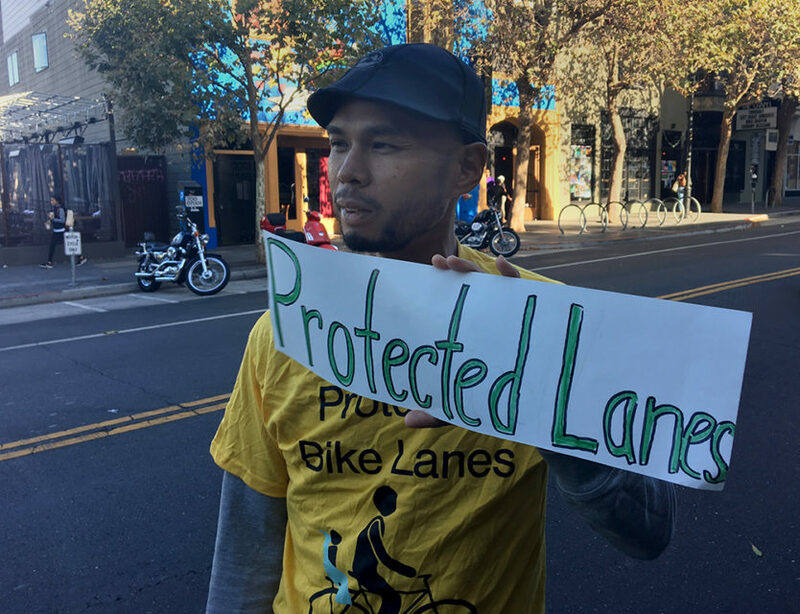 The San Francisco Municipal Transit Agency is looking at funding protected bike lanes, an action which would need approval from the agency’s Board of Directors as well as the Board of Supervisors.